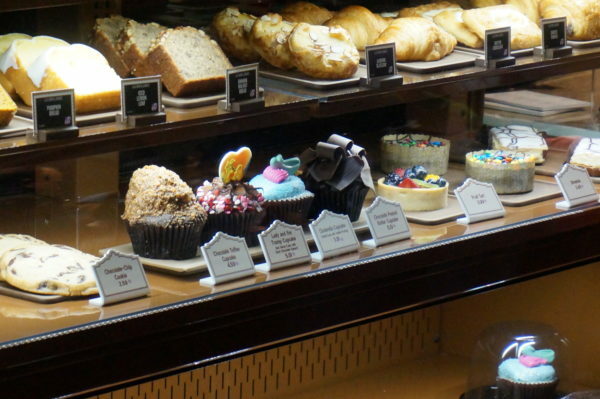 Disney World has some amazing food options, but too many really good foods are overlooked in favor of the most popular items like the Mickey Ice Cream Bars and Dole Whips. Don’t get me wrong; these foods are pretty awesome, but there are others that are equally delicious and maybe better and also unique to Disney World! 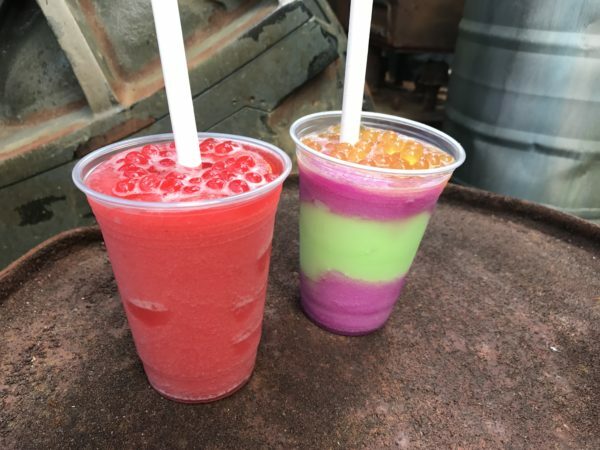 Let’s take a look at the top 24 overlooked foods you must try in Disney World! 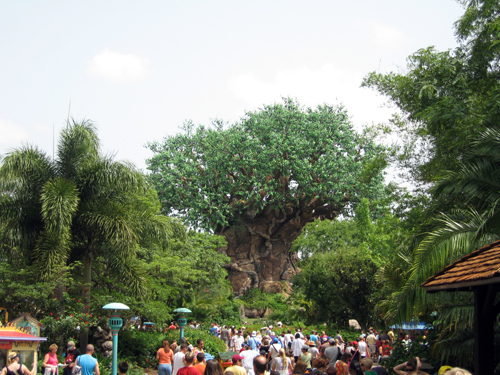 When Pandora – The Land of Avatar opened in Disney’s Animal Kingdom, Disney Chefs created some incredible food and drinks to fit the theme of the land. Try the drinks at Pongu Pongu! Pongu Pongu is a quick-service lounge focusing on all kinds of drinks. Try the Night Blossom, which is a non-alcoholic blend of lime, apple, and pear topped with boba balls. This icy treat is a great way to beat the heat in what is often considered the hottest park in Disney World. Magic Kingdom is indeed a magical place, and Main Street USA is one of the more quintessential locations in the park with a small-town feel and stores, shops, and restaurants that could be found in Anywhere, USA. Right at the end of Main Street is a ballpark-themed quick-service dining location called Casey’s Corner. You can find pretty standard fast food here, but the one thing you don’t want to miss is the Corn Dog Nuggets. While you can technically get these in several locations around the resort (and they’re usually on the kid’s menu), there’s nothing quite like snacking on some corn dog nuggets while watching the Happily Ever After fireworks show over Cinderella Castle! For the next must try food on our list, we’re going to head to Disney’s Animal Kingdom Lodge. Sanaa is one of the delicious and highly rated restaurants at this resort hotel not only for the food but also for the view of the African Savanna. Enjoy the view, but we’re here for the food too. Check out the Indian-style bread. It’s on the appetizer menu, and it comes with three accompaniments including hummus, chutney, and jam, but there are actually nine accompaniments in all, and you can try all of them for an extra $2, which is totally worth it! Disney’s Hollywood Studios is going through some growing pains, and one casualty was the Starring Rolls Café where the Butterfinger Cupcake was a fan favorite. The chocolate toffee cupcake is on the far left. 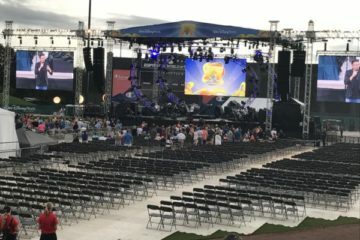 It’s bigger than it looks! 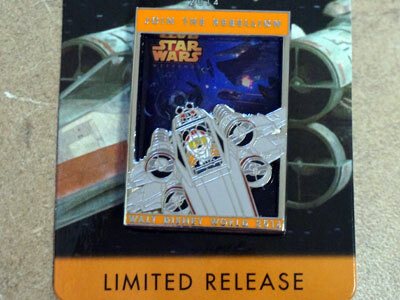 When Starring Rolls closed, fans thought all was lost. However, Trolley Car Café, a Starbucks location more-or-less across the street, came to the rescue. It picked up this cupcake, and named it the Chocolate Toffee Cupcake without changing the recipe! It’s still a chocolate cupcake with a chocolate fudge center, buttercream frosting, and chopped Butterfingers on top. Oh, and did I mention that it’s huge? Magic Kingdom is the home to some very unique foods, and one of those foods can be found in Liberty Square at Sleepy Hollow. This walk-up window has a pretty limited menu, but they’re famous for their waffle sandwiches. 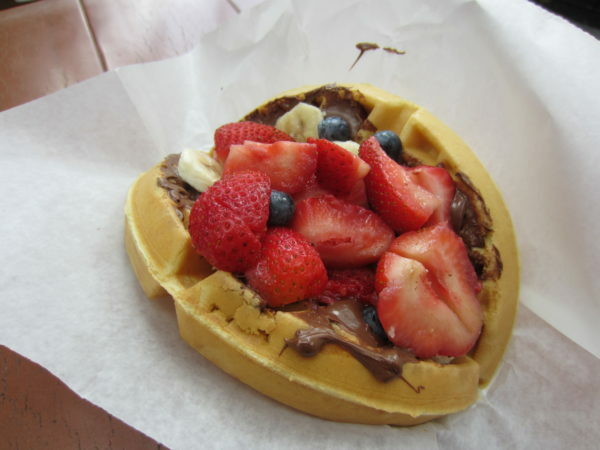 My favorite is the Strawberry, Banana, Nutella waffle sandwich on the menu as the Fresh Fruit Waffle Sandwich. It’s amazing! The Fresh Fruit Waffle Sandwich is an amazing invention! Florida is known for its heat, which can toy with a hundred degrees in the dead of summer with oppressive humidity. On days like that, it’s a good thing Disney has created some tasty, icy drinks. Stop by the Cheshire Café in Magic Kingdom’s Fantasyland where you’ll find a few different Minute-Maid drinks including the Raspberry Lemonade Slushy, which comes with a souvenir Mickey Straw! Disney’s Polynesian Resort holds a special place in my heart, and the food here is delicious and unique especially the Pineapple Bread at Kona Café. The bread by itself is really good, but when you top it with the macadamia nut butter, the South Pacific Flavor really comes out! The Lunching Pad sits inconspicuously under the Tomorrowland Transit Authority People Mover. The menu is limited to a couple sandwiches and some pretzels, but one pretzel variety puts all the rest to shame. The Pepper Jack Warm Stuffed Pretzel is a warm pretzel stuffed with heated, cheesy, gooey pepper jack cheese. It’s one of the more savory options on our list, and anyone who likes a pretzel and cheese with a bit of a kick will love this special snack! There’s a good bit of alcohol available in most of the parks and the Disney resort hotels, and there’s a lot of variety in drinks. One of the best but most overlooked adult beverage options can be found at Disney’s Beach Club Resort on Disney’s Boardwalk. Beaches and Cream is most well known for their Kitchen Sink Sundae, but too many people miss their Hard Floats because of this. Two of the best are the Grasshopper Float made with Guinness and mint chip ice cream and the Tropical Sunrise Float with Ace’s Pineapple Hard Cider and rainbow sherbet. Raglan Road in Disney Springs is an authentically Irish dining location. They serve equally authentic Irish fare, and one of the best things on the menu isn’t even on the menu; in fact, it’s complimentary. That’s right! The Irish Soda Bread is free with your meal! The bread itself is a bit dry, but the Guinness reduction sauce that comes with it soaks in perfectly and takes amazing! Oh, and while you’re enjoying your complimentary bread and waiting for your meal, you might even be serenaded by Irish dancers or musicians. One of my absolute favorite frequently overlooked foods in Disney World is actually many things at the Karamell Kuche (Caramel Kitchen) in the Germany Pavilion of World Showcase. All of the chocolates and caramels at Karamell Kuche are delicious and beautiful! This place serves everything you can think of covered in caramel and chocolate. Make your selection, enjoy a couple now, and save some for later when you’re relaxing at your resort! Don’t worry about missing this very small store; you’ll smell it! 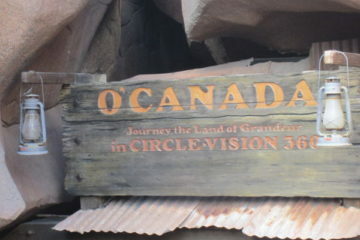 One of the most popular activities in Disney World for those of age is to Drink Around the World at Epcot. One stop on this journey would be in France. 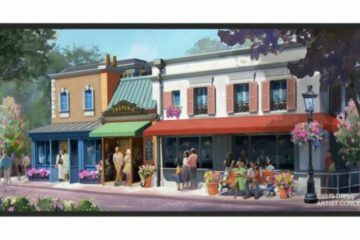 Look for the unsuspecting drink cart on the promenade near the World Showcase Lagoon called Les Vins des Chefs de France. The Orange Slush, made with Grand Marnier, Rum, Grey Goose Orange, and Orange Juice, is also a great way to stay cool on a hot day! As I mentioned above, the Disney Chefs invented some brand new dishes for Pandora. One such creation is at the Satu’li Canteen, which is actually a variety of dishes with your choice of protein, base, and sauce. I suggest the slow-roasted sliced grilled beef bowl with vegetable slaw, and whatever base and sauce you want. Create your own Satu’li Bowl at Satu’li Canteen! 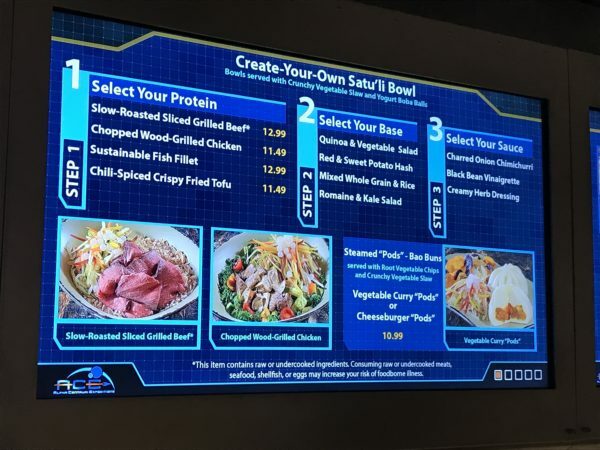 Satu’li gives you a break from traditional theme park food since there’s nothing fried here, and there are even some vegetarian options for those with dietary restrictions. Our next stop is Olivia’s Café at Disney’s Old Key West Resort. This is a quick service location serving sit-down meals for breakfast, lunch, and dinner. This is a great place to stop for breakfast mostly because of the Banana Bread French Toast. It’s banana bread done French toast style topped with Banana Rum Syrup and coconut whipped cream. If you’ve ever been to Disney World, it’s likely that you’ve tried or at least seen the Mickey Premium Ice Cream Bar, which is available all over the resort in the parks, the water parks, and all of the hotels. There’s another ice cream that is also unique. It might not be in the shape of Mickey Mouse, but the ice cream cookie sandwich is definitely too often overlooked. 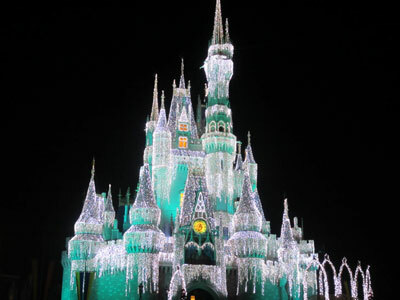 It can be found in several locations around the resort, but it’s most magical in Magic Kingdom. Plaza Ice Cream Parlor is adjacent to Casey’s Corner, so if you’re not feeling like corn dog nuggets during the fireworks, get in line early and grab an ice cream cookie sandwich instead. You won’t be disappointed! Restaurant Marrakesh in Morocco is one of the more unique restaurants with several unfamiliar ingredients. However, if you’re willing to look past the unfamiliar, you’ll find that many of the dishes are actually very good. For example, the Beef Brewat Rolls with minced beef and eggs might turn people off, but the fried pastry on the outside sprinkled with cinnamon and sugar is more familiar. These are similar to the more familiar egg rolls served at many Chinese restaurants. Keep in mind that Restaurant Marrakesh is a table-service dining location, so Advanced Dining Reservations are recommended. Norway is another World Showcase pavilion known for different ingredients. However, much of the Norwegian dishes are on the sweeter side! The School Bread, for example, is considered a dessert. It’s less sweet than a donut, but it’s filled with vanilla custard and topped with icing and coconut. The School Bread in Norway is like a donut, but it’s not quite a sweet. It’s served at the Kringla Bakeri Og Kafe, and it’s based on the food Norwegian children used to bring to school with them, thus the name “School” Bread. The Daily Poutine was a welcomed addition to Disney Springs towards the end of the retheming project. 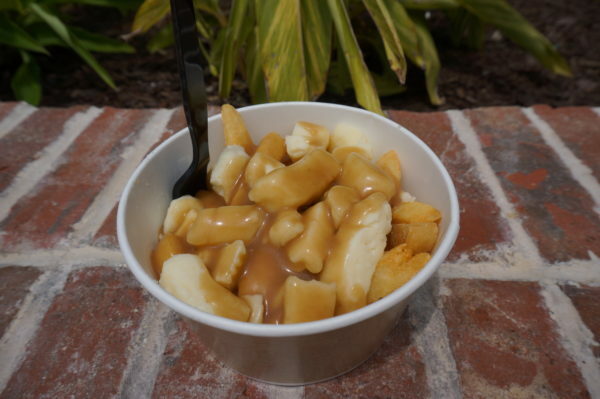 Classic Poutine uses French fries, gravy and cheese curds. There’s also a French version and an Italian version plus a Latin version that uses fried yucca instead of the classic potato fries. How could you go wrong with potatoes, cheese, and gravy? If you follow my blog at all, you probably already know that Flame Tree Barbecue in Disney’s Animal Kingdom is one of my favorite quick-service restaurants in Disney World. I’m a real sucker for BBQ! Everything at this restaurant is good, but diners often overlook the Baked Mac & Cheese with Pulled Pork. It’s a pretty large portion, so I hope you’re hungry! 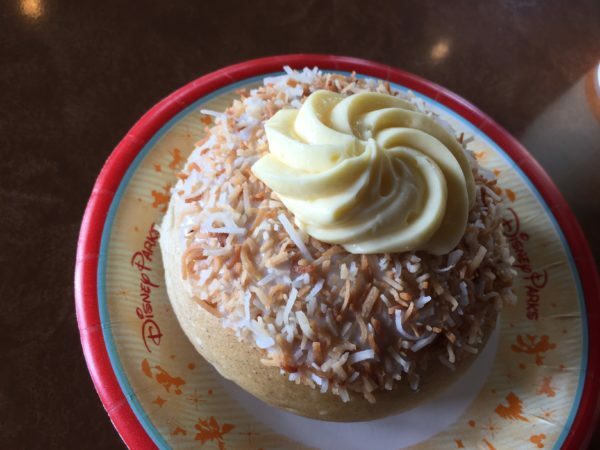 If you’re looking for a bit smaller portion, head over to Eight Spoon Café in the Discovery Island section of the park where you can find a smaller portion of the same dish. There isn’t really any bad food in the France pavilion, so it’s hard to try everything. Then once you find a favorite, you might stick with it every time you visit. I’d like to encourage you to step out of your comfort zone and try the often-overlooked Croque Glaces at L’Artisan de Glaces. 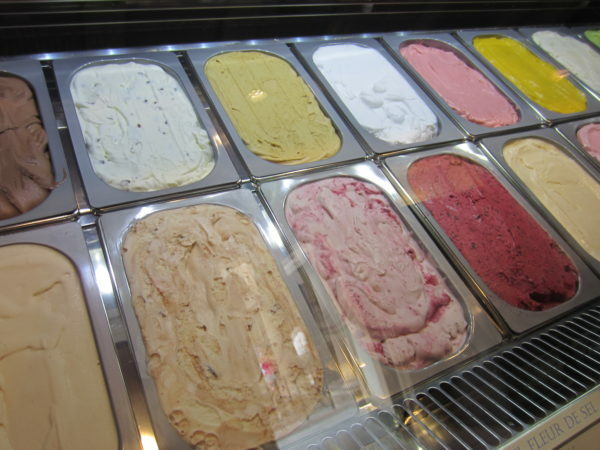 Here are some of the flavors you can try inside your Croque Glace! The Croque Glaces starts with a freshly baked brioche bun. When you order a Croque Glaces, the bun is cut in half, and you get to choose one of the 16 house made ice cream flavors plus your favorite sauce. A heaping scoop of ice cream is situated on the center of the bun, covered in either chocolate or raspberry sauce, and pressed between the bun in a fancy Panini press kind of machine. This step seals the edges so your ice cream doesn’t squeeze out the sides. Don’t worry! The process leaves your ice cream perfectly frozen! ‘Ohana restaurant at Disney’s Polynesian Resort is a very popular dining location with a character breakfast in the morning hours and a South Pacific themed dinner in the evening. Advanced Dining Reservations can be very difficult to come by, so you typically have to reserve up to six months in advance if you’d like to dine here. Fortunately, one of their best dishes, the ‘Ohana Bread Pudding, has been added to the Tambu Lounge right outside of ‘Ohana where you don’t need an ADR! The bread pudding is a delicious take on the classic Irish dish with vanilla ice cream and bananas foster cream sauce! Pecos Bill Tall Tale Inn and Café in Frontierland‘s Magic Kingdom is a great quick-service dining location with lots of variety in a Southwest theme. One great option is the Fajitas Platter with beef, chicken, rice, beans, vegetables, and tortillas. Then, you can also use the Fixins bar to add more toppings! For just $14.99, this is a great value, and it’s large enough to feed at least two adults. 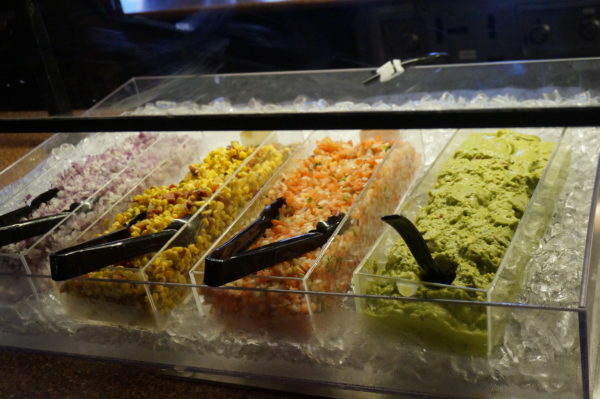 Once you order your fajitas, stop by the Fixins Bar and fill up on toppings! Morimoto Asia in Disney Springs was one of the high-end table-service restaurant additions. It’s named after Chef Morimoto who is one of the world’s best Japanese Chefs. Chef Morimoto has created a massive menu that is a real culinary adventure. One item is the Morimoto Spare Ribs, which are spare ribs with cilantro and hoisin sweet chili glaze. You might get a little messy, but it will be so worth it! Gaston’s Tavern is named after everyone’s favorite egotistical narcissist, who has an eye for the beautiful main character of Beauty and the Beast, Belle. When you enter his tavern, it’s obvious that he totally loves himself. 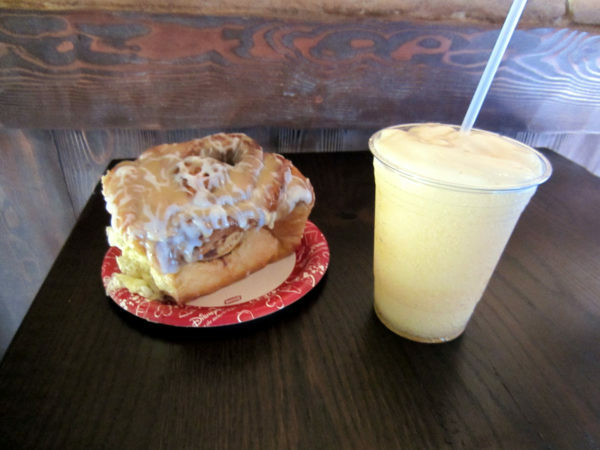 LeFou’s Brew is the signature drink of Gaston’s Tavern, but it’s also known for a colossal cinnamon roll. Interestingly, he named a drink at his tavern after his sidekick. LeFou’s Brew is an apple and toasted coconut drink topped with passion-fruit mango foam and served in a souvenir cup. LeFou’s Brew was, undoubtedly designed to look like a glass of beer to fulfill the theme of the tavern, but it does not contain alcohol. 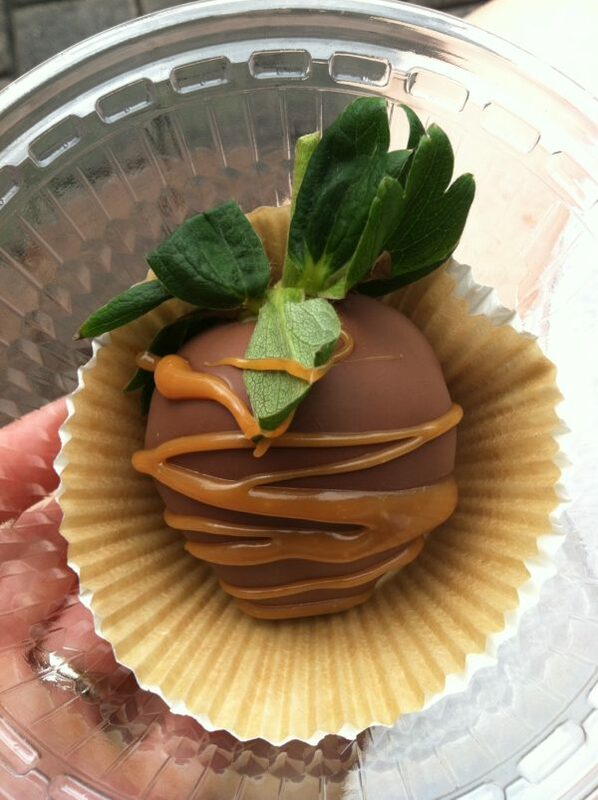 Your favorite food in all of Disney World?